One reader, Kim, left a comment months ago sharing that she’d made my Breakfast Cake recipe into muffins instead of baking the batter into a cake. It sounded so good that I decided to try it right away! And then I forgot. For months. Turns out these are an easy, yummy, freezable, on-the-go breakfast muffin that is hearty enough to keep us satisfied until lunchtime. Thanks for the idea, Kim! Next time you share a great idea like this one, I’ll try to get around to trying it before thirteen months go by. Sheesh. Stir together flour, oats, salt and baking soda. Add butter, buttermilk, honey, eggs, and vanilla. Fold in chocolate chips, raisins, or other dried fruit. 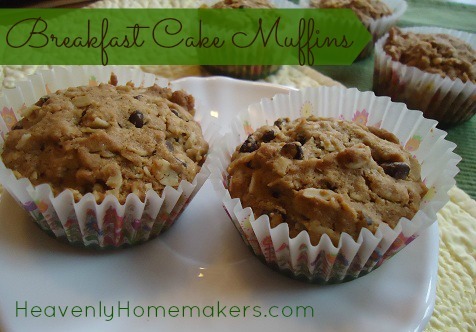 Spoon batter into 18 paper lined muffin tins. Bake in a 400° oven for 20-25 minutes or until muffins are golden brown. It sounds so yummy! Can you use quick oats? Yes, I believe that would work! I’ve used almost every one of your bread recipes as muffins, and your muffin recipes as breads. The kids love the change up. Is the texture/taste the same after freezing? Perfect timing, Laura. I’m leaving for a business trip on Saturday. I will be making these for my kids/husband before I go! PS – you are quite famous at our house….the lady that gave me the recipe for Giant Breakfast Cookies. My kids are willing to try ANY of your recipes!! PPS – Love the new cookbook!!! With a slight adjustment to the amount of liquid, these would be an excellent way to use up leftover cooked oatmeal, too. I love butter , cream, coconut oil & my own yogurt .. SO I used half coconut oil for half the butter. and my own yogurt instead of the milk. I also added blueberries & raisins. my flour is brought from a co-op & is white , but not bleached, it bakes SO nice. my mom is 87 & rarely eats well.. so I am taking some up to her today. I’m about to whip up a batch of these right now for tomorrow’s breakfast (and a little late afternoon snack). Thanks Laura! I made your breakfast cake for the first time this morning and it was a hit! I usually make muffins so thought I’d mix it up a bit and make the cake version instead. I used a half cup butter and a half cup of unsweetened applesauce instead of the whole cup of butter and used 1% milk instead of buttermilk and it still turned out very moist and delicious! Thanks for the recipe! thank you soo much for posting this recipe. I had some bananas I had to use up and so I threw those in, and reduced the milk and egg a bit and tossed in some walnuts with the chocolate chips. My daughter doesn’t want to stop eating them, and I can’t blame her! We have tried a few other recipes you have posted on here too and we have not been dissapointed. Thank you, again! I would love to add some peanut butter for some protein. Anyone have an idea of what changes I shoulda me to adjust for it? I would just add the peanut butter at the end and if the batter seems too thick then add a touch of milk. I am betting it will be yummy! I’ve done this with your applesauce bread for awhile now! We love it as muffins and it bakes in 20 min.! Yes! I often put less sugar in my recipes. Works great! We made these today and they were sooooo good! My 6 yr old asked me what we were making. I told him Breakfast Cake Muffins. He said, “You mean Breakfast Cupcakes.” Haha! I used 1/2 cup raw honey, and I did use 1/2 cup applesauce for part of the butter, some were dried apples with cinnamon added in, about 2 raisin, and 6 with chocolate chips. With my oven, about 14 min. was all they needed. I’m enjoying your site and recipes so much! I have baked the Honey Whole Wheat bread several times and it has turned out PERFECTLY! Yeah! My oldest daughter – Laurel – (she’s in college) and I work together on two Etsy shops and a TeacherspayTeachers shop. I’m a homeschool mom too and I have two more daughters at home still in homeschool. It’s been a wonderful experience. I have made these several times, and absolutely LOVE them! They truly are hearty enough to tie me over until lunchtime. Thanks, Laura, for all your recipes (and inspiration)!! Thanks for this variation–my toddlers just gobbled up several mini muffins. Just so you know, I made them vegan (and a little cheaper whilst still retaining the complete protein) by using soymilk, light brown sugar, a ‘flax egg’, and coconut oil. We had a surfeit of speckled bananas so I mahed one up in the batter too. They turned out great, with a light taste of banana rather than a banana bread (which we just had…). I think even DH will like them! Thanks! Can you sub whole wheat for einkorn flour? So far, I’ve successfully made Breakfast Cookies with it but muffins are trickier! I think so, though I haven’t used einkorn enough to know much about it. I have successfully subbed it for wheat flour in several of my baked goods!